Albuquerque New Mexico INLAYS and ONLAYS – Discolored, blackened, stained and decayed teeth impart an unsightly appearance to your teeth. Dental decay, trauma, accidents and poor oral hygiene maintenance can lead to cavity formation in your teeth which necessitates placement of fillings for the restoration of lost natural tooth structure, daily functions of eating, drinking, biting, chewing, speaking and most importantly, smiling with confidence while dealing your clients and colleagues at your office. Simple fillings are sufficient to achieve satisfactory results in majority of cases involving minimal loss of tooth portions. When large cavities form in your teeth, simple fillings cannot provide long term restoration of structure, function and esthetics. Dental crowns are in common practice for such situations with extensive removal of sound tooth enamel along with the decayed and damaged portions for achieving retention and support. Keep reading for Albuquerque New Mexico INLAYS and ONLAYS. Albuquerque New Mexico 24 hours emergency specialist cosmetic & restorative dentist Dr William C Gardner at NM Family and Cosmetic Dentistry PC provides a more conservative restorative treatment option as compared to complete coverage dental crowns for your decayed, damaged and blackened teeth in the form of esthetic, tooth colored dental inlays and onlays in situations where simple teeth fillings are not effective. Q. 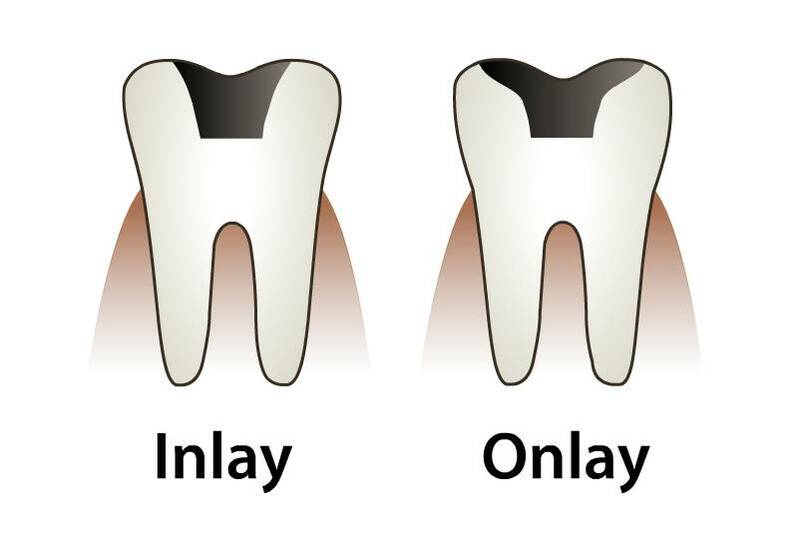 WHAT ARE DENTAL INLAYS AND ONLAYS? A. Dental inlays and onlays which are also termed as indirect fillings can be described as laboratory fabricated well-fitting, stronger tooth restorations for decayed and damaged teeth which cannot be treated with simple direct fillings. These provide long term and cost-effective reparative solution for compromised natural teeth. Keep reading to know more about Albuquerque New Mexico INLAYS and ONLAYS. Q. HOW DENTAL INLAYS AND DENTAL ONLAYS ARE DIFFERENT? A. Dental inlays are just like simple indirectly fabricated fillings which are cemented within the centre of teeth or in between the cusps covering small portions of chewing tooth surfaces while dental onlays are usually designed to cover cusps or parts of cusps or biting surfaces of teeth along with adjoining occlusal areas. Dental onlays may cover the complete biting surface or cusps of teeth. Q. WHICH MATERIALS ARE USED IN THESE RESTORATIONS? A. Dental inlays and onlays can be fabricated from various types of materials which can be broadly categorized as cast metals and tooth colored. Tooth matching materials are more popular due to enhancement of smiles, self-esteem and appeal. Q. WHEN SHOULD YOU OPT FOR DENTAL INLAYS AND ONLAYS FOR YOUR TEETH? Keep reading to know more about Albuquerque New Mexico INLAYS and ONLAYS. Q. WHY DENTAL INLAYS AND ONLAYS ARE BETTER? • Strong resistance to stains. Do you have cosmetic defects in your teeth? Is it making your smile less pleasant? Is this owing to decayed, missing, crowded, crooked, mal-aligned or mal-posed teeth? You can visit your 24 hours emergency Albuquerque New Mexico dentist Dr William C Gardner. Book an appointment at NM Family and Cosmetic Dentistry PC. He is available throughout day and night. He focuses upon best solution for improving your dental and oral health conditions. Get in touch for Albuquerque New Mexico INLAYS and ONLAYS.